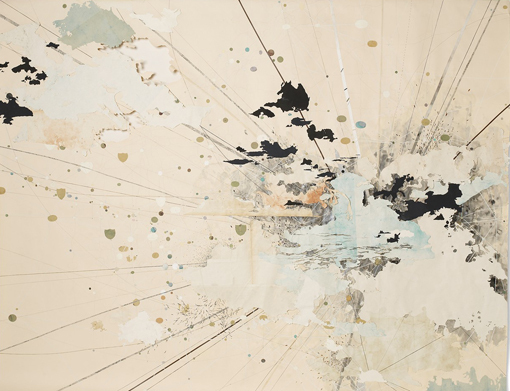 Val Britton connects paper fragments through collage, drawing, painting, staining, printing, stitching and cutting to create mixed media abstract works that draw on the language of maps. She earned her BFA from the Rhode Island School of Design and an MFA from California College of the Arts. A recipient of the Pollack-Krasner Foundation Grant, she has participated in residencies and fellowships such as the Affiliate Program at Headlands Center for the Arts, Recology in San Francisco, the Millay Colony for the Arts, Kala Art Institute, Jentel and the Ucross Foundation. Her work is held in public collections including the New York Public Library, the New-York Historical Society, the Library of Congress and the Achenbach Foundation for Graphic Arts/Fine Arts Museums of San Francisco and has been featured in New American Paintings, Sleek Magazine (Berlin), Invisible City (Melbourne), Artweek and The Map as Art: Contemporary Artists Explore Cartography by Katharine Harmon.